Welcome to the The Honor Legion website. Thanks for visiting & please check back often! 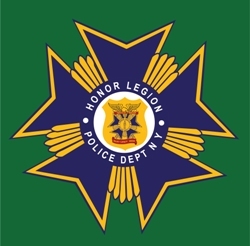 The Honor Legion, founded in 1900, is the oldest Fraternal Organization in the New York City Police Department. The Honor Legion is composed of members of the Police Force of the City of New York, comprising all ranks, who during the history of the Honor Legion have received Department recognition and have been awarded medals of Honorable Mention for deeds of valor performed at imminent risk of life or who have been commended for meritorious acts at personal risk, and who are entitled to wear the insignia of their Department. It holds in one great bond of comradeship the Honor Members of the Department, Heroes of the Finest. It recognizes no rank. It is a force within a force, a tower of strength to combat evil; an inspiration from within, a beacon of hope for the weak, a leaven for good. Its tenets: self-respect, courage, loyalty and devotion to duty. The underlying purpose of the Organization is to render aid and comfort to the survivors of the Members of Service who have made the supreme sacrifice in the performance of their duty: (Fidelis Ad Mortem). This purpose is carried out by the Members of the Honor Legion with the thoughtfulness of mind that there but for the grace of God go I. The Honor Legion is a Fraternal Organization which through social functions fosters comradeship and brotherhood recognizing no ethnicity or religious differences. A police officer is someone, who at one point in their life, wrote a blank check payable to the citizens of his/her city for an amount up to & including their life. For information on Upcoming Dinner Meetings & Events please visit our calendar page. Please book individual & group Dinner Meeting Reservations on our reservation page. For the most recent & archived News please visit our news page. To join & become a New Member or Renew Your Membership please visit our membership page. To order Honor Legion Merchandise please visit our store page. To view our photo albums including Photos & Videos please visit our photos & video page with a link to our photo sharing website. Please browse to our President's Message, Board of Directors & Links pages & if you have any questions or comments please visit our contact page. Read about the NYPD Honor Legion History here.